Films based on patriotism are not only being preferred but also have been performing well at the box office. This is the reason why history is being explored and the stories are going to find stories on which films can be made. One such case of Battle of Saragari is recorded in the pages of history. Afghani was aggressive on the British, but the Sikhs fought bravely. Therefore, the Sikhs were deployed at Fort Lockhart, Gulistan and Saragarhi Fort. On September 12, 1897, there was a fight between the 36th regiment of the British Indian Army and the Afghan elites. In which only 21 Sikh soldiers fought with ten thousand activists and had taken hours for the battle to end in a few minutes. These aggressors attack Saragarhi with the intention of capturing the three posts in a single day. Instead of fleeing the crowd, these 21 men decide to fight and fight till the last breath under the leadership of Ishar Singh (Akshay Kumar). Due to long stretching of the fight, help goes to other posts and the intentions of the aggressors collapse. Director Anurag Singh has prepared this event on the basis of some fiction fiber film. In such films, there are now some fixed formulas, and this is also seen in Kesari. 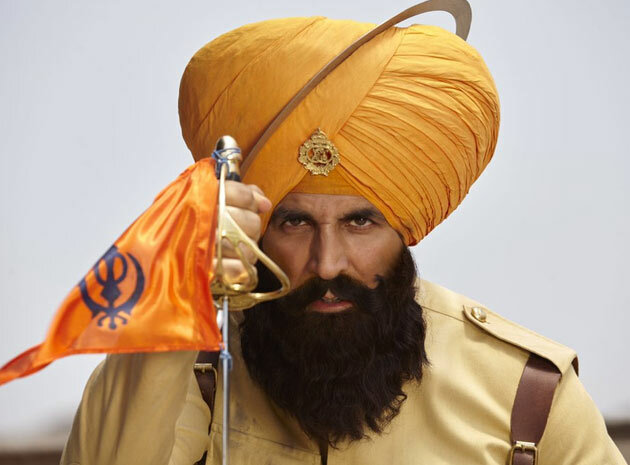 Remember the soldiers' memory and worry of their parents, the gaffe (not coming from the border), a soldier who does not laugh, is a very young person who has never killed anyone, all of them Things also appear in 'Kesari'. This part of the director has kept the audience entertained and kept the movie long and is the weak part of the film. When the rough patch is over, the film returns to the track again when the battle starts. Some people may be shocked that this fight was fought under the flag of the British Indian Army, in which the Sikh soldiers were, but as soon as the Sikh soldiers declare that they do not fight this war as a slave or for the British, And for the soil fighting is made in the film. The audience is aware of what is going to happen in the film, but here the film gets the point so that it is told in a very good way. Especially the fight scenes have been shot very carefully and the story of country love has been beautifully erected in it. In the name of country love, speechless speech has not been kept. The bravery of the soldiers, the eloquence and the depiction of emotions also makes the eyes moist. The climax of the film is tremendous when Akshay Kumar continues to fight like a lion with guns, swords, stones, and the last breath. Anurag Singh's work as a director is good. They have taken care of that period's war art, political situation and costumes. They have added some clips and whistle scenes with cleverness in the film. If they save the film with some 'typical formulas', then it would have been better. The music of the film tears up the story. The editing is tremendous and the scenes of war have been added in a great way. Akshay Kumar is the life line of the film. From the first frame to the last frame they are covered. He has control over every frame and taking advantage of it, he has kept the film on his shoulders. They handle the film wherever there is weakness in the film. In the form of Ihsar Singh he looks like a lion and his sense of leadership also appears. Parineeti Chopra's role is not too long, but she makes her appearance. Surminder Singh Basra as Gurmukh Singh, Survinder Vicky as Nayak Lal Singh, Dana Bhardwaj as Lance Naik Chanda Singh, and other actors, including Brahma Mishra as Khuda Shankar are also good. This saga of the strength and courage of 21 soldiers can be seen.